On Wednesday, I headed off to the Gravenhurst Farmers’ Market to pick up 3 bushels of apples. The drive there was breath-taking as all of leaves on deciduous trees are in brilliant shades of orange, yellow, and red. It makes me very thankful to live in a semi-remote part of the world where the landscape still seems relatively untouched. Thankful! Allin’s Orchard and Country Market has a wonderful array of freshly picked apples and although their season doesn’t start until August they are by far the busiest booth at the market now. Their apples look and smell so delicious it was hard to walk away with just 3 bushels. Brian kindly helped me load a bushel of Courtlands, a bushel of Wealthys and a bushel of Honey Crisps into the truck. The Courtland and Wealthy apples were Brian’s recommendation for making sauce so that is what I’m going to try this year. And, over the course of the next few years I am going to try making sauce with as many of their 26 varieties as I can. Afterall, everything comes down to personal preference and individual taste but I don’t think you can go wrong when you are following the suggestion of someone who knows apples in the way the Allin’s do. 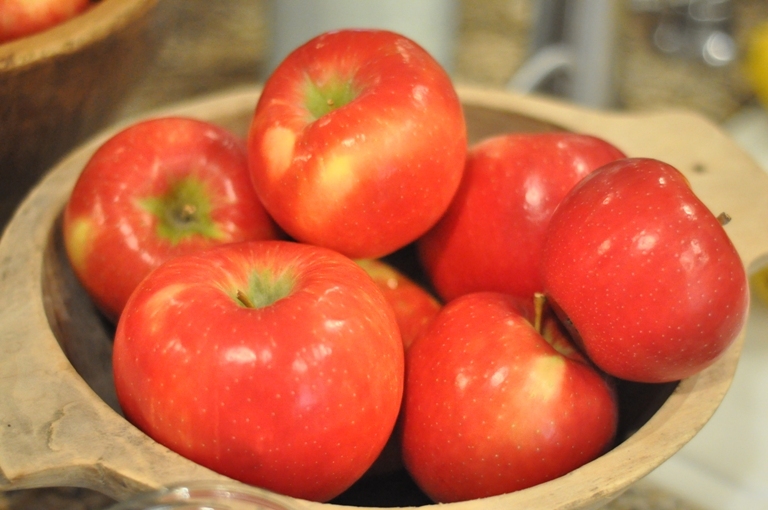 The Honey Crisps, were my big splurge, as they are one of the most expensive apples on the market but they are the shiniest red and have a sweetest taste…it is out of this world. I am actually drooling as I think about it. Wait…I’ll be back…going to get one! Now, back to making apple sauce. 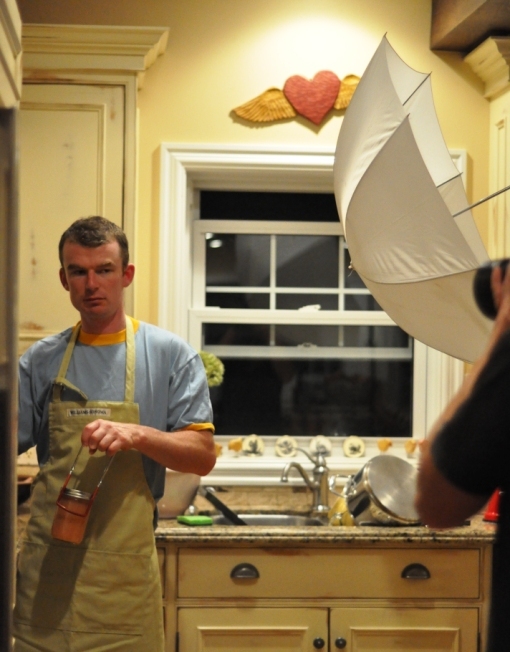 Tonight we had the privilege of having photographer Scott Turnbull of Turnbull Photography over to shoot us “canning in the kitchen” for an upcoming issue of The Muskoka Magazine. How exciting!?! When he got all of his equipment set up in our kitchen, the dome lighting, amazing camera gear, flash equipment everywhere…I have to admit I felt a bit like a TV celebrity. Okay, get your head out of the clouds and focus on the sauce. Obviously, we choose to make apple sauce because that is the time of year it is…and apples are ready to be made into sauces, pickles, butters and anything else your little heart desires. 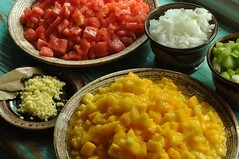 Making apple sauce is so easy and let’s not forget lots of fun! 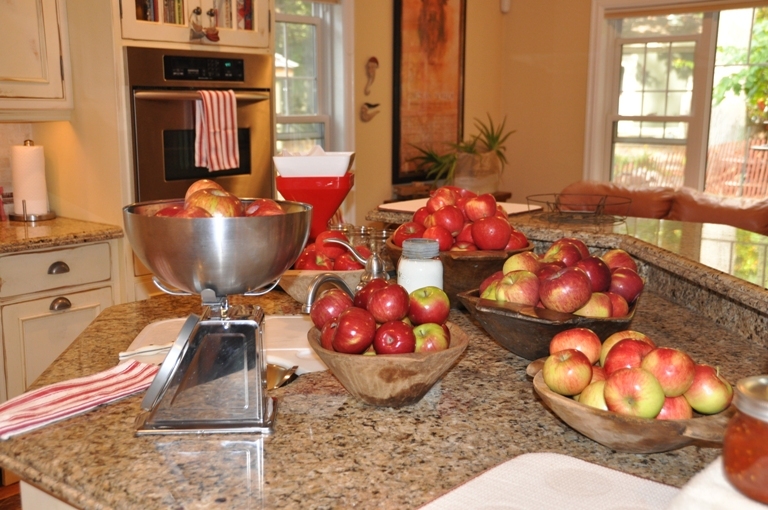 We started out with a clean kitchen and bowls of apples everywhere. Working in batches cut the apples into chucks about 2 inches big and place them in a 8 quart sauce pan with 1 to 1 1/2 cups water. 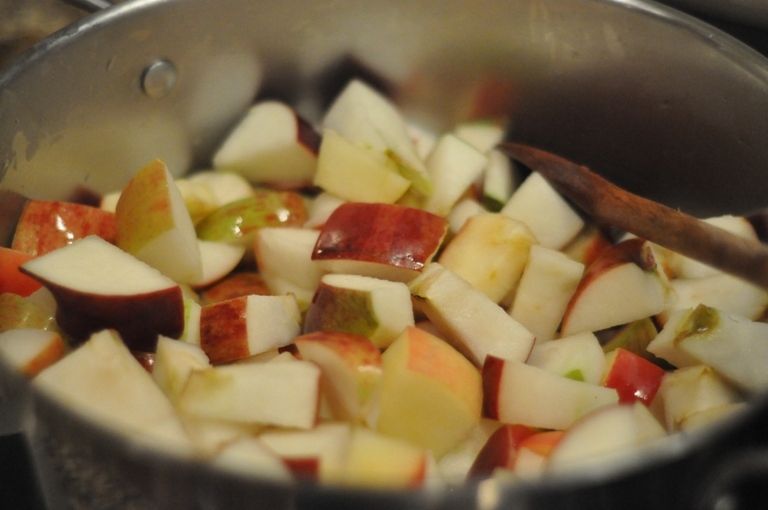 Bring to a simmer on medium-high heat and cook until all of the apples are soft and mushy. Stirring often to makes sure they do not stick to the bottom. It takes about 15-20 minutes depending on the crispness of your apple. Put cooked apples through a food mill to remove all of the skin and seeds. Collecting the apple puree in a bowl. Put apple puree in a larger 20 quart stainless steel saucepan and add 4 tbsp of lemon juice. Bring to a boil and boil for 5 minutes. At this point, you can check the taste of your sauce to see if you would like to add sugar or spices, such as cinnamon or nutmeg. We decided to do plain apple sauce. Ladle hot apple sauce into sterilized jars, leaving 1/2″ headspace. Remove air bubbles and adjust headspace, if necessary, by adding hot apple sauce. Wipe rim. Center lid on jar. Screw band down until resistance is met, then increase to fingertip-tight. Place jars in canner, ensuring they are completely covered with water. Bring to a boil and process for 20 minutes. Remove canner lid. Wait 5 minutes, then remove jars, cool, label and store. Please note: Apple sauce tends to siphon. We processed two batches one that siphoned and one that did not. The next day, remember to remove rings and clean jars or you may have a sticky mess on your hands when you go to open them up. Hi, I just canned my first batch of applesauce and it siphoned. The seals seem fine. Is this ok or should I re-can? If they have sealed they are fine. This has happened to us before. We would recommend taking off the rings and cleaning the jars and of course checking the seals now and before consumption. Some types of apples siphon more than others when made into sauce. There are a few ways to try to reduce the siphoning: (1) make sure to heat/cook the applesauce well before jarring ~ this releases the air the fruit contains. (2) correct headspace is important and (3) after processing, be sure to let the jars sit in the hot water bath for about 5 before removing them. These things should help but sometimes it does not completely eliminate the siphoning. As long as they’ve sealed I wouldn’t worry. Only reprocess if they have not sealed or simply refrigerate them.